I love John Dory. Not the person…I don’t know anyone by that name. No, I love the fish. That’s right, I am in love with a fish named John Dory and I seriously can’t believe I’ve gone this far in my life without trying it until this year. One taste of its sweet and delicate fleshy meat and I was hooked. Where has it been all of my life??? Certainly not in my kitchen nor on my plate. The taste of this fish reminds me of shrimp which led me to wonder if John Dory would be equally delicious as a substitute to the crustacean in other dishes. I’ve pan fried it and served it atop garlic and white wine pasta. I’ve even tried my hand at making fish cakes with it. BUT, the way I liked it was poaching it in a salty, spicy broth. Inspired by one of my favorite Mexican dishes, camarones a la diabla (spicy seafood), I decided to poach the delicate fish in a similar mixture of white wine, garlic and chili peppers. However, being here in Malaysia and so far away from Mexico, it can be difficult to get habaneros, pablanos and all the other delicious chilis so plentiful in Mexico. So, what did I settle with? A hodge-podge of local red chilies which happily did the trick. If you can find those special Mexican peppers, feel free to use them but if not, no worries. You can always make do without. I am happy to say that my chili pepper short-comings worked out nicely. The end result is a slightly spicy sauce tomato and white wine broth that doesn’t overpower but instead compliments the delicate meat of the dory. Add the citrus elements of the fresh cilantro and lemon juice and it’s one tasty dish! Roughly cut up the tomatoes, garlic cloves and red chilies (with the stems removed). Drizzle tomatoes, garlic and chilies with 2 tbsp melted butter and roast in the oven at 220C/450F for about 20 min. Once cooled, blend the roasted chilies, tomatoes and garlic together in a food processor or blender with 2 cups of water. Transfer to a large saucepan and heat over medium high heat. Bring to a boil, then add 1/2 cup white wine. Continue cooking until alcohol has cooked off and mixture has reduced by half. Once reduced, season with salt and freshly cracked pepper to taste. Add dory fillets and spoon sauce over the fish until completely submerged. 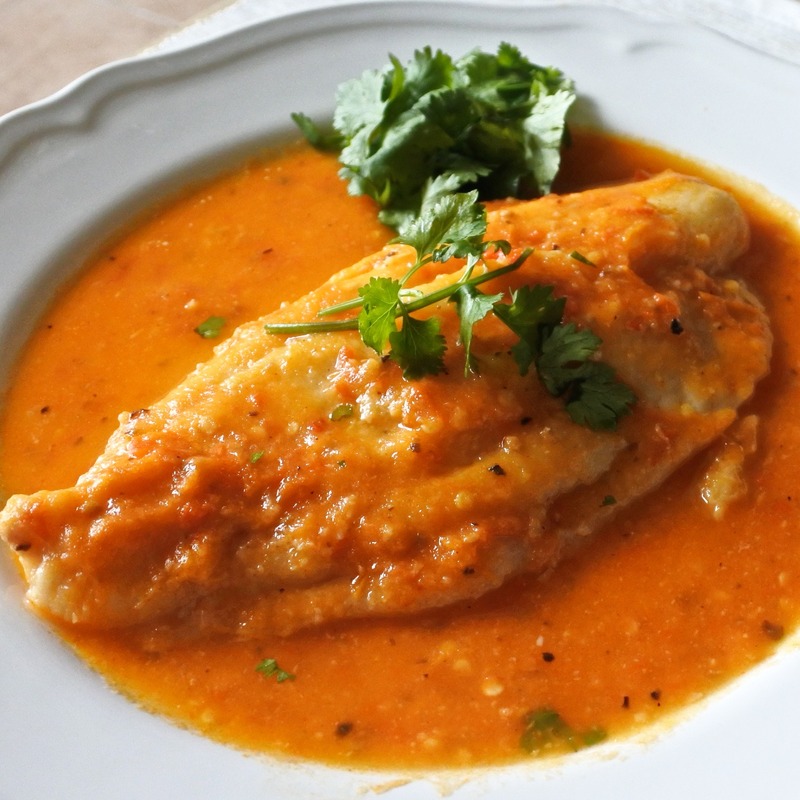 Poach on a medium simmer in the sauce for 8-10 minutes or until fish is firm and flaky. Top with chopped cilantro and drizzle fresh lemon juice on top.